To import data from QuickBooks Desktop, first download and install the Fathom Desktop Connector. This will enable you to extract and upload data from your QuickBooks files (.qbw) without having to manually key data or export data to excel. For system requirements and other information please see our article on using the Fathom Desktop Connector. 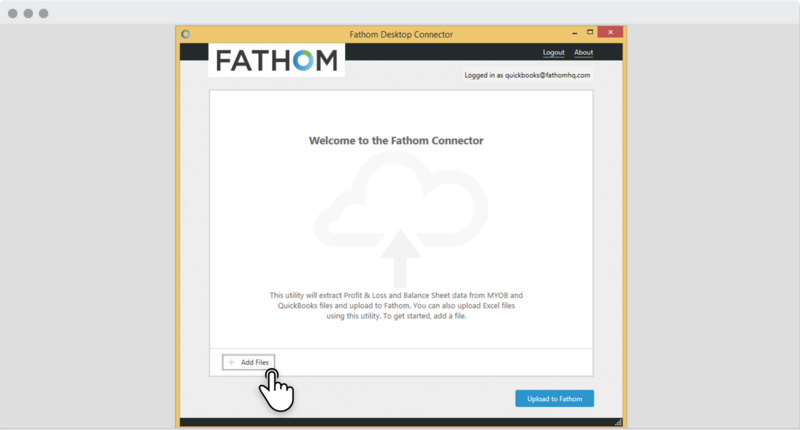 Note: If your QuickBooks Desktop files are hosted or in a server environment, please see our article on Using the Fathom Desktop Connector in a hosted or server environment. TIP: To troubleshoot any connection issues please see our article dedicated to QuickBooks Desktop connection issues. Which versions of QuickBooks are supported? The Fathom Desktop Connector will work with any recent version of QuickBooks Desktop from the US, United Kingdom and Canada. We support versions from the current year and the three years prior. This includes Pro, Premier (all editions), Simple Start & Enterprise Solutions. Start QuickBooks and open your company file. Login as the 'Administrator'. 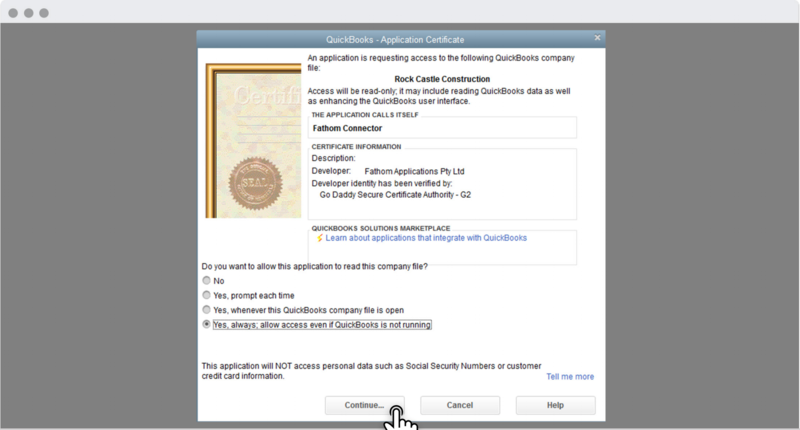 Ensure that there are no other company files open and that all dialog boxes in QuickBooks are closed. Within the Fathom Desktop Connector, click 'Add Files' to select your QuickBooks file. This should be the same file you first opened in QuickBooks. QuickBooks will ask you to grant permission to the Desktop Connector. Return to the QuickBooks program and grant permission before proceeding. Choose 'Yes, always; allow access even if QuickBooks is not running' in order to make it easier to connect next time. Your company file is now ready to be imported into Fathom. To connect Fathom to the company file initially, you must be the Administrator user. Note that there is only one administrator per QuickBooks Desktop file. Fathom allows you to import tracking class data for analysis. You can choose to import tracking classes during the initial import process or add them to existing companies. After connecting your QuickBooks company file as described in the previous section, you will be prompted to select which tracking classes you would like to import or update with your QuickBooks file. Click ‘Confirm Selection’ to continue with the import. Click ‘Upload to Fathom’ in the Fathom Desktop Connector to begin the import process. Fathom will then securely extract the data from your QuickBooks Desktop file, along with your selected tracking classes. 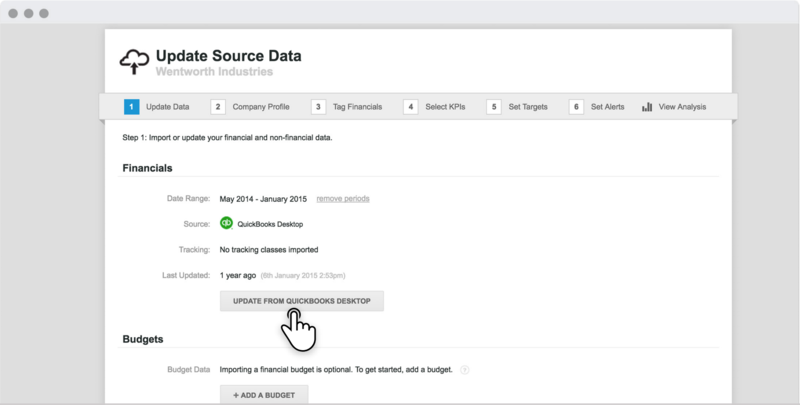 To update data for your tracking classes, or add tracking classes to an existing company in Fathom, simply relaunch the Fathom Desktop Connector and upload the QuickBooks Desktop file again. You can launch this from 'Step 1: Update Data' in the company setup. What if I am the accountant and not the administrator on the company file? The administrator is the only user who can make the initial connection, but they can set the connection up so that other users are allowed to perform subsequent connections. 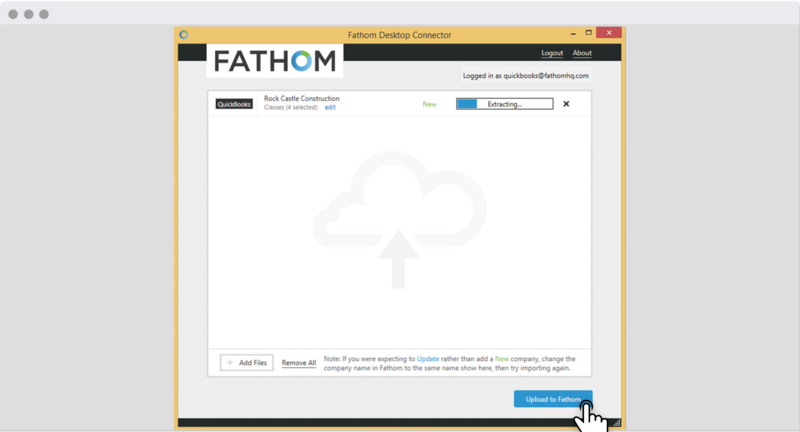 For this approach to work, the owner of the file will need to be comfortable creating a new user and performing an initial connection to the Fathom Desktop Connector in their environment. Alternatively you could ask them to briefly change the Administrator password and send you the file so that you can facilitate this process for them. Create a new user with the ‘Accountant’ role (if you don’t have one already). 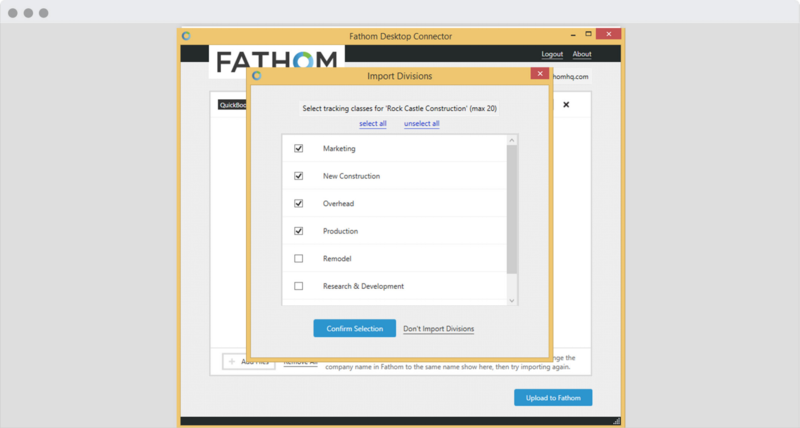 While logged in as the Administrator and with the company file open, go through the normal process to import using the Fathom Desktop Connector. When selecting the access permissions make sure you select to access the company file using the new ‘Accountant’ user. Subsequent updates can be achieved using the new login that you control. If the client has sent you the file make sure you send them back the updated copy and ask them to reset the password.